Welcome to Aston Hills! Where are you both from originally? Matt: And I’m from Balhannah. What made you choose Aston Hills? M: We love the open space up here… and we wanted to stay close to friends and family. T: We love being in the country but close to the city. We went to see all the other developments in Mount Barker and spoke to friends who had bought here and in other places. I work at Ray White too so I knew this was a great development. For me Aston Hills was an easy option. 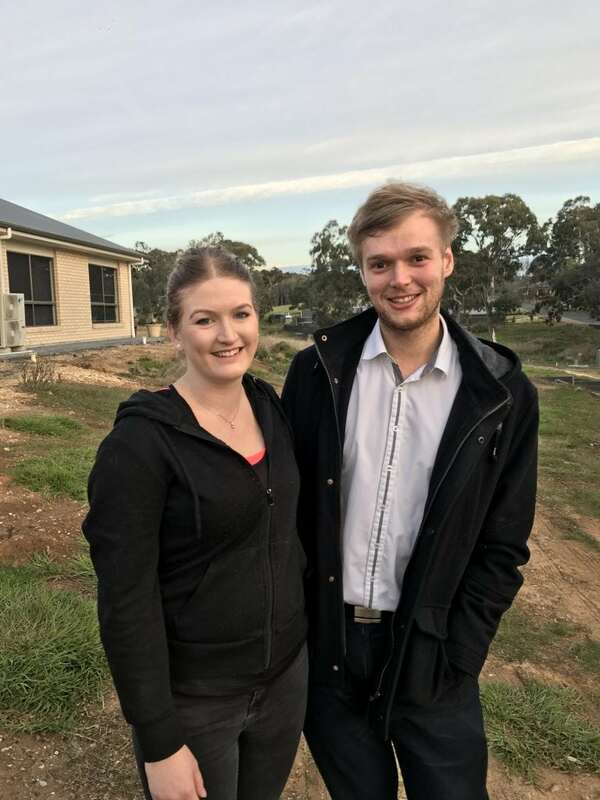 M: We liked that Aston Hills was going to have the second town centre in Mount Barker, we liked the fact there was lots of young families moving in. It has a really good feel to it when you’re here. T: It does, it’s got a good, family feel. How did you guys select your block? M: We came and did a drive through and found another block we thought we liked and reserved one, but once we started looking at house designs we decided on this block instead. It’s a bit smaller and meant we could spend a bit more money on the house. It’s more comfortable. We looked through all the books of house designs and narrowed it down to six, then three, then we got quotes and made a decision. What builder did you decide on? M: We’re building with Statesman Homes, they’ve been great. This is your first home – how did you find the first home buyers process? T: It was actually really easy. M: It was pretty good, our mortgage broker helped us with the paperwork. Who’s going to do all the selections? What are you looking forward to most about building your new home? T: Being finished and moving in! M: We’re really looking forward to moving in. Our neighbours are great. I’ve always lived on a farm so I’m not used to having neighbours, it will be fun. We’re also looking forward to moving out and having our own space!